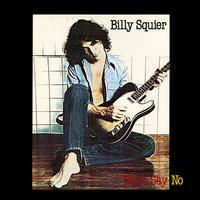 Billy Squier's guitar rock classic Don't Say No LP! Billy Squier's 1981 classic rock staple Don't Say No catapulted the singer/guitarist into the big time, leading off with the Led Zeppelin-carbon copy "The Stroke," as well as hits "In The Dark," "My Kinda Lover," and "Lonely Is The Night," all of which enjoyed heavy rotation on the newly-founded MTV, helping Squier expand his audience even further. His live shows became arena rock sensations; the album is a near-perfect example of early-'80s melodic hard rock, and even less enduring (but hardly inferior rockers) such as "You Know What I Like" and "Lonely Is The Night" keep up the intensity. And Squier also finds time for the occasional ballad, like the disarmingly gentle "Nobody Knows." Don't Say No is 100% Analog Mastered by Kevin Gray at CoHEARent Audio from the original master tapes! Gray's remastering is revelatory in opening the soundstage up to massive proportions while providing superior 3D imaging and musical microdetail. The LP art is restored by IR's Tom Vadakan to a beautiful single-pocket gatefold and the old-style, "tip-on" LP jacket is printed by Stoughton Printing. First the sound quality is excellent. Record was flat, a plus in my book Nice cover, and record came in a vinyl sleeve, not paper. This was my first order with Acoustic Sounds and I'm impressed with the packaging. It makes Am-----n's packaging look they sent it in an envelope. I had this in mp3 but wanted to hear what it sounded like on vinyl. It rocked me and the neighbors dog. He barks when I play something he likes.